For such a long time the Lacoste Touch Of Pink perfume has been one of my all time favourites. It takes me back to my school days and its a perfume that i am absolutely in love with. Admitedly i dont have a bottle of it on the go at the minute, however i have a feeling i will be popping it on my Christmas list! It is sweet smelling, fruity and floral and a perfect scent for a girly girl. This scent first came on the scene 7 years ago, by perfumer Domitille Michalon. It has top notes of coriander leaves, blood orange and cardamon, heart notes of jasmine, violet leaves and carrot seed and base notes of sandalwood, vanilla and musk-like notes. I urge you all to have a sniff, this really does take me back to my teen years! Also in the Lacoste touch of pink range are deodorants and shower gels. Prices start from £30 for 50ml which i think is a good price and is available from Boots, The Perfume Shop and department stores. 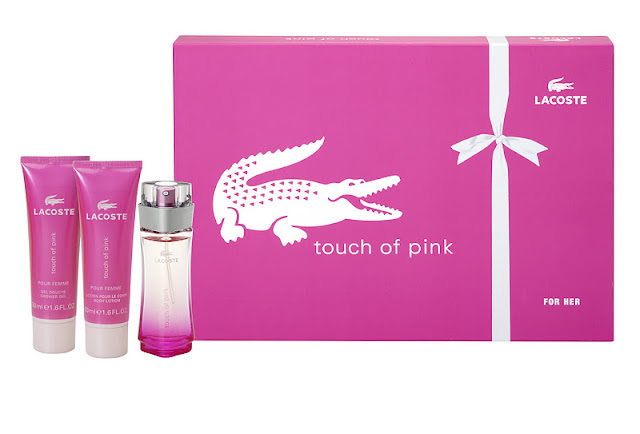 With that said, I am so happy to say that i have got a Lacoste Touch Of Pink Gift Set to giveaway to one lucky reader, just in time for Christmas! I would absolutely love to win this myself! The giveaway is open from right now, until Friday 16th December (so it closes in 4 days time!) so you will receive it before Christmas. All i ask is that you are from the UK, are a reader of my blog and leave a comment below asking to be entered, along with your email address if it isnt on your blog so i can contact you if you win. The winner will be picked randomly on Friday & announced on my blog. Ahhh absolutely LOVE the blog, and touch of pink! What a fabulous giveaway prize! My friend used to wear this all the time! I'd love to enter please! Woo what a great giveaway! I love Touch of Pink :) Please enter me. Great giveaway , I've always wanted to try this , I'd love to be entered! I'd love to be entered please Sinead! One of my favourites! Please enter me! Enter me please :) - this is a lovely giveaway..
Great prize, I've had this perfume in the past and love it! This is my day time fav! This is such a lovely perfume, I'd love to be entered! Great blog! please enter me! I'd love to enter :-) Never tried this perfume before! what a great giveaway! I love Touch of Pink :) Please enter me. Ooooh, yes please! I would love to be entered thank you! I (heart) Lacoste Touch of Pink! I love this perfume...reminds me of school too! Have been umming and ahhign about buying it again! I'd love to try this, enter me please hunnie :).